According to the NY Daily News, the Moreno brothers, Alcides and Edgar, were working on a window-washing platform attached to a skyscraper on E. 66th St., New York, when the platform collapsed on December 7, 2007. The 16-foot-long aluminum swing to the roof failed. 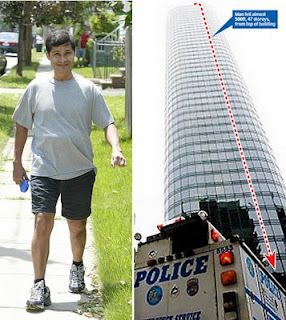 Alcides Moreno cheated death after falling from the 47th story of the building, but Edgar didn’t survive. The doctors performed at least 16 surgeries, because Moreno broke his ribs, both legs and right arm, badly injuring the spine. The medical staff described the victim’s recovery as “miraculous” and “unprecedented.” Doctors predicted that Moreno’s recovery would be complete in one, two years.